Traveling can be a a bit stressful on the skin. Wether it is short distance or across the globe it can make a lasting impact on your skin, making it dull, very dry, and just not in its happiest state. 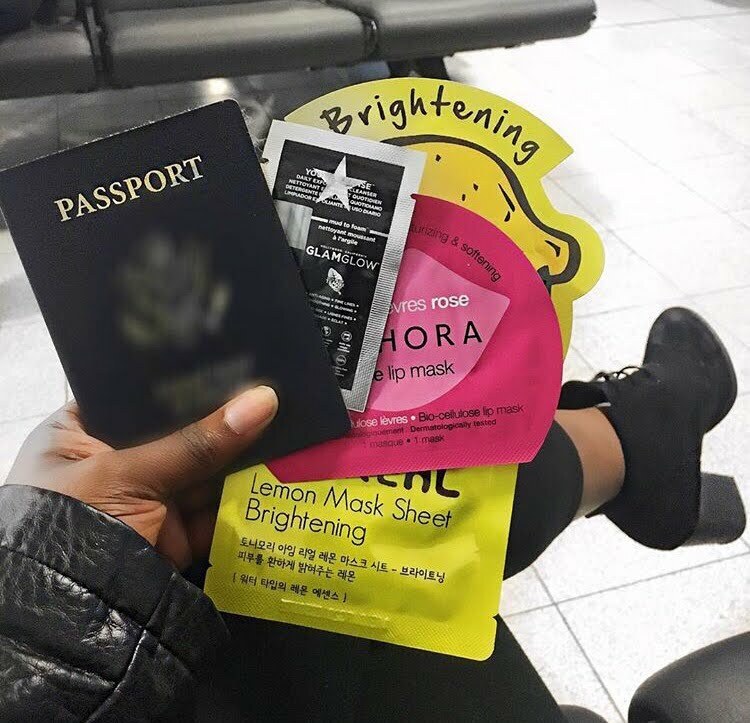 I mean traveling is always fun, so we have to make our skin feel the excitement as well and keep our skin glowing on board. If you haven't yet, follow me on Instagram ! Shameless plug there guys. Here are five products you should constantly have in your bag and the best times to use it when you are on board a plane. Why you need it: You might not think about it, but you don't know who sat on that sit before you, if they had the flu, or if they just had bad habits like picking their nose, etc. I just prefer to be safe than sorry, because I don't want to transfer the dirt to my face, or the grossness to any part of my body. Best time to use it: Once you locate your sit, before you sit down, wipe up the whole sit area, and any part of the plane you will most likely be touching such as, the remote, the tv, the window blinds, window, handle of the chairs, the pockets in front of you, the light and air switch above you, etc. Why you need it: Your hair carries a lot of oils and products on it, its best to keep it away from your cleansed face. Best time to use it: Right when you have sat down, and are getting comfy for the long flight. Why You need it: You want your skin to breath, especially when you will fall asleep. Also you want a clean face to apply all the products for it to absorb well. If you are like me, I barely ever travel with make up on. Don't think it is necessary, so I go bare but cleanse my face before I leave for the airport. I do carry my make up to apply on the plane; usually powder, eye liner, mascara and lip gloss. Keep it simple. Best time to use it: Once the plane takes off, I am all buckled in and I know I am not moving from my sit anytime soon. Why you need it: You need to use treatments and serums that have anti-bacteria properties and also will brighten and hydrate your skin while on the flight. The is a good time to use this since you wouldn't be moving much for the few hours you are on the flight. Best time to use it: On a clean face, after you cleanse your face, or wiped it up. Why you need it: On the plane, the speed at which it goes and the height of which it flies influences the dryness of your skin. so you need something to keep your skin hydrated the whole time. Not just a hydrating face moisturizer you will also need body moisturizer as well. Best time to use it: When you take off, after applying serum and treatment on your skin. This helps to lock in moisture through out the flight. Why you need it: On the flight sometimes the moisturizer starts to fade off and you just need a quicker upper to refresh your skin, instead of adding more moisturizer, which can clog your pores, I just spray the cooling, refreshing mist over my face. Best Time to use it: Every time my skin starts to feel dry, I spray a couple of pumps around my face and you can instantly feel the cooling and hydration restore. These are real necessities that will take you through the flight and leave you feeling fresher and brighter than you came in. Do you have any products that are a must to travel with? lets talk in the comment box below.